Most people know that it is pretty easy to find a dentist who can perform Invisalign treatment to straighten your teeth. What most people do not know is that all Invisalign is not created equally. This blog will debunk two myths surrounding Invisalign today. Myth #1: All Invisalign treatment is the same, no matter which dentist you see. Myth #2: All Invisalign costs $6000. The reason this statement is a myth is because there is a WIDE variety of education, skill levels, and experience among current Invisalign providers. Did you know that a dentist only has to complete a two day course to become certified as an Invisalign Provider? This is a good starting point, but for your treatment, it is important to see a dentist who has gone far beyond this requirement. Because Invisalign uses advanced technology, it is continually evolving and improving. 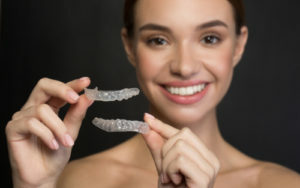 It is important for your dentist to continue learning about Invisalign, so you need to see someone who stays up-to-date with Invisalign by taking continuing education courses on a yearly basis at the minimum. Our doctors are committed to continuing education in all areas of dentistry, and they each take Invisalign courses at least once per year (usually two to three times per year). Dr. Ann and Dr. Lauren are always on the cutting edge of Invisalign technology. Invisalign is a versatile tool in the hands of the right dentists. Unfortunately, it is not a magic wand that automatically gives you the beautiful smile you want. Utilizing Invisalign aligners to move teeth in every precise amounts and directions requires a high level of skill. Not all dentists can move your teeth with Invisalign in the same way. At Designer Smiles, we have seen many patients who are on their second attempt with Invisalign because the first round with another dentist did not produce their desired results. Our doctors have the skill level necessary to use Invisalign as the tool it was made to be. While staying current on the latest news with Invisalign is important, nothing beats good old fashioned experience. Experience is the best teacher, and experience makes the best teachers! Dr. Ann has been creating beautiful smiles with Invisalign since 2005, and her great skill and experience led Invisalign to ask her to teach courses for them. Dr. Ann teaches other dentists how to do Invisalign better. It should be pretty obvious that we, at Designer Smiles, LOVE Invisalign. We love the beautiful smiles it creates, and we love the discreet way it creates those beautiful smiles. We know that some people do not even consider Invisalign as an option due to the cost. Did you know that there are several different treatment options with Invisalign that range in cost? We are able to perform minor tooth movements at a fraction of the cost of traditional Invisalign. Because our doctors have a high skill level, they are able to give you an idea of what kind of movement, and therefore what results, you can get from different levels of Invisalign treatment. Invisalign’s technology allows us to “preview” the predicted tooth movement with a specific number of aligners. It is like having a “good – better – best” option. What will it take to get your smile to “good”? How much more treatment (and cost) is involved in getting it to “better”? And we can give you the “best” smile with full orthodontic treatment with Invisalign. The important thing to know is that there are options! The only way to find out which option will work for you is to come in for a consultation with Dr. Ann and Dr. Lauren. Invisalign is a highly individualized treatment. No two people are alike in their current tooth position or their predicted tooth movement. We treat each patient as a unique case, with specific needs and desires. Not only do our doctors have the education, skill level, and experience necessary to give you the beautiful smile you want, our team has the experience and knowledge necessary to help you make it happen! Johnita, our office manager, and her team have been helping people fit Invisalign treatment into their budget for over thirteen years. She knows the ins and outs of dental insurance coverage of orthodontic treatment. She is familiar with all the current financing options for dental care. If you tell her that you are ready to start your Invisalign treatment, she will help you figure out the financial commitment involved. The most important thing to remember that the cost of Invisalign is an investment. And unlike other things you could spend thousands of dollars on, like a new car or flat-screen TV, your smile will not depreciate or become obsolete! The money you spend on Invisalign now will pay off for the rest of your life. Want to Find Out how You can Get Started with Invisalign? Call our office today to schedule a consultation with Dr. Ann and Dr. Lauren. They will put their years of education and experience to work to give you the beautiful, straight teeth you’e always dreamed of.